I had this problem recently. No matter what browser I used, I couldn’t get past the login screen of the vSphere Web Client. 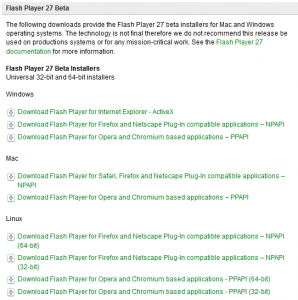 My PC had upgraded to Flash Player 27.0.0.170 a few days ago. I attempted to uninstall this version and install a previous one with no success. But after doing some research, I found a KB Article from VMware. The first step was to uninstall Flash Player cleanly. I found the link below which allowed me to download a Flash Uninstaller to cleanly remove the app. It’s recommended to reboot after uninstalling. Download the flash player for the browser you’re using, be it IE, Firefox, Opera, Chrome (or Chromium), etc..
Once I upgraded to the beta version mentioned above, the Web Client started working normally again!